Ladies and gentlemen, I have found my official pattern for summer — McCall’s 6559. This knit tank dress pattern (post-tweaks, of course) is nearly perfect — easy, casual, chic, and comfy. On top of that it is quick and easy to sew up since it only involves two pattern pieces plus neck and armhole bands. My fabric for this dress was one of my treasures from last year’s NYC trip. I don’t know the exact fiber content but I would guess some viscose and elastane. It is a lightweight, soft knit with great recovery. I strayed from the pattern instructions (didn’t even look at them, actually) for the neckline and armhole binding. I have never been satisfied with the bands that most patterns call for so when Lauren at Lladybird posted about this binding method from Megan Nielsen, I was all over it. I LOVE the results and don’t think I’ll ever go back to the bands unless I have a fabric that is uncooperative. I stabilized my neckline with knit staytape from Emma Seabrooke and used Lite Steam-A-Seam 2 and a twin stretch needle for my hem. I have gotten so many compliments on this dress, especially about how professional the finishes look. As with all Big 4 knit patterns I have encountered, this one runs huge so I just based my size choice off of finished pattern measurements, going with a 12 in the shoulder, grading to a 14 at the bust/under the arms for a cheater FBA, tapering in to a 10 at the waist and then back out to a 14 at the hips. If I had gone by the measurement chart I would have cut a 16 in the bust, 14 in the waist and an 18 in the hips! I started with a wearable muslin from a sturdy cotton knit and realized that I would have to make all future versions with a center back seam if I wanted it to fit my figure. I had to take a 3/4″ swayback adjustment and then added a 1″ wedge back in over the derriere to accommodate for the swayback adjustment plus some for the junk-trunk. There will definitely be more versions of this dress in both the long and short varieties. On the next rendition, I think I will go ahead and trim the seam allowances down to 1/4″ for serging and I will raise the neckline a bit to make it more work-friendly. I will also take a bit more out for the swayback adjustment so it hugs my low back better. Finally, because my fabric is a bit heavy, this dress could use some reinforcement in the side seams to support the weight. I will be adding some clear elastic to the seam allowances from the underarm to the hip to prevent stretching and will keep this in mind for future versions if the fabric is really stretchy. 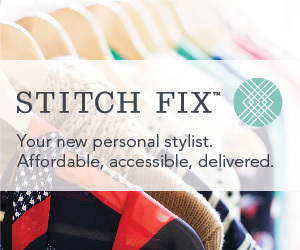 I don’t think it will be an issue with less stretchy knits. So what do you think? Could knit dresses be your go-to this summer? So would you like to add a quick, easy, and tasty chicken dish to your recipe box that you can whip up even on weeknights when you are exhausted? If so, look no further than this delectable specimen from the Garden and Gun blog. As you may recall, I already have a recipe for what I consider to be the best oven roasted chicken. But if you’ve tried it or read the recipe, you know that it is a little time-consuming. I mean, it can be done on a weeknight but it’s best if you do some of the prep work in advance. This recipe, though, is so easy, you can get the bird into the oven within about 15 minutes. And you should have most of the ingredients on hand, except maybe the fresh rosemary but that will keep for a while or you could just grow some outside your back door. I have made this chicken now 3 or 4 times and each time it is moist, tender, and very flavorful. Mr. Homemaker gives this dish his seal of approval so chances are your hungry man will, too. If you are like me and don’t like bourbon, don’t worry, it isn’t a strong flavor. If you’re like someone else in my house and you like bourbon, you could always increase the amount in the recipe to bring out the bourbon flavor. As I talked about in my other chicken recipe post, trussing the chicken helps it cook evenly. Watch this video for a good how-to. This recipe also involves preheating a cast iron skillet in a very hot oven. Needless to say, this should necessitate care as the chicken and sauce will both sputter when added. Wear your oven mitts. Place an average-size cast iron skillet on the lowest rack of the oven and preheat to 500F. Season the chicken all over, inside and out, with the salt and pepper, then rub with the olive oil. Truss the chicken. Combine the rosemary, soy sauce, honey, molasses, bourbon, and Dijon mustard in a small saucepan. Cook over medium heat until just warm then remove from the heat and set aside. When the oven and pan are preheated, place the chicken — breast side up — into the skillet and cook at 500F for 10 minutes. Reduce the oven temperature to 350F and pour the prepared sauce all over the chicken. Be careful because it will sputter. 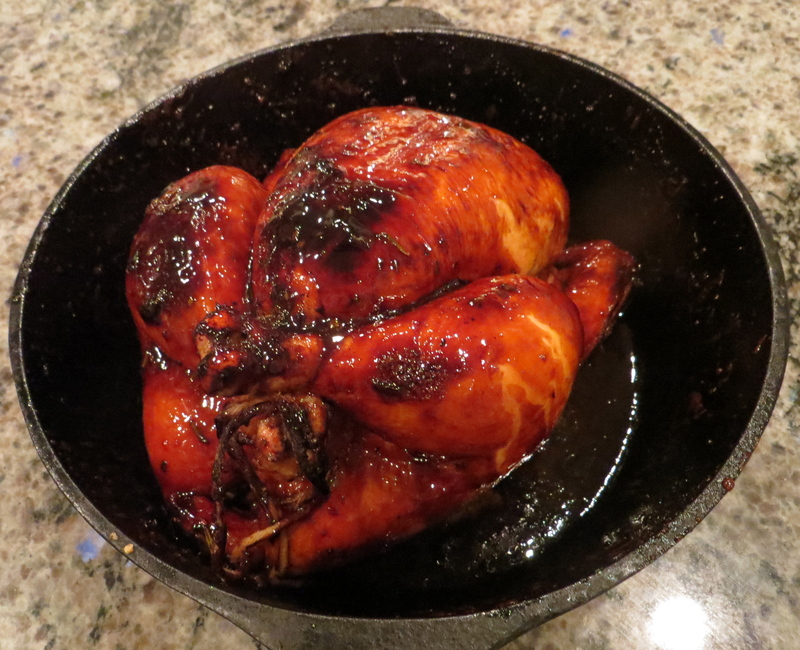 Continue to roast the chicken at 350F, basting with the sauce in the bottom of the cast iron skillet every 10-15 minutes. Cook until the chicken is done, the juices run clear, and a meat thermometer inserted into the breast reaches 160F. This portion of cooking usually takes 30-45 minutes for me but will vary based on the size of your bird. Once the chicken is done, remove from the oven and let cool for 10 minutes. 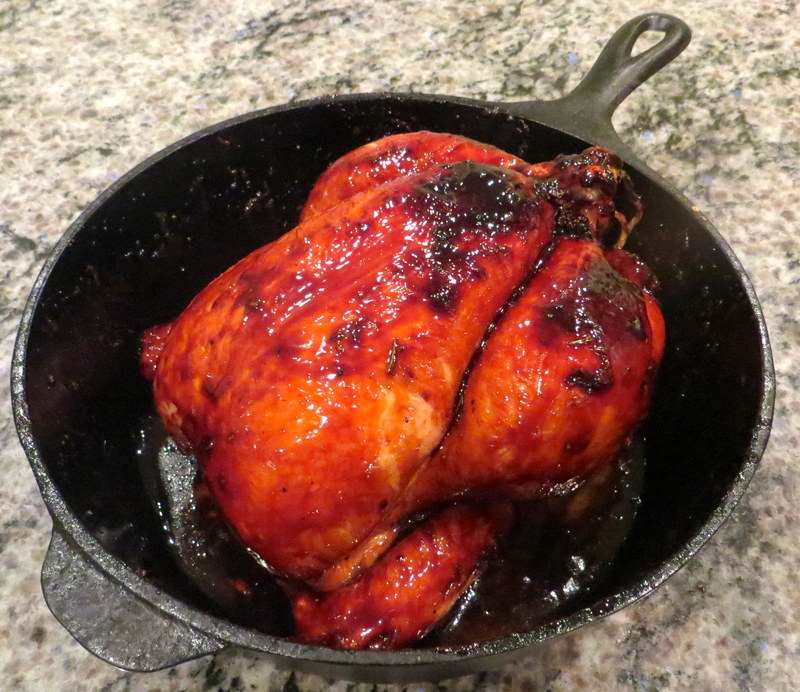 Transfer the chicken to a carving board and place the skillet on the stove over medium-high heat. Heat to a boil and boil for about 1 minute, or until the sauce has thicken slightly. Cut the chicken into pieces and serve with the sauce. And maybe some Granny-Style Green Beans and mashed sweet potatoes. May 20 (Monday) — Today was a full day in the office. Nothing exciting to report. 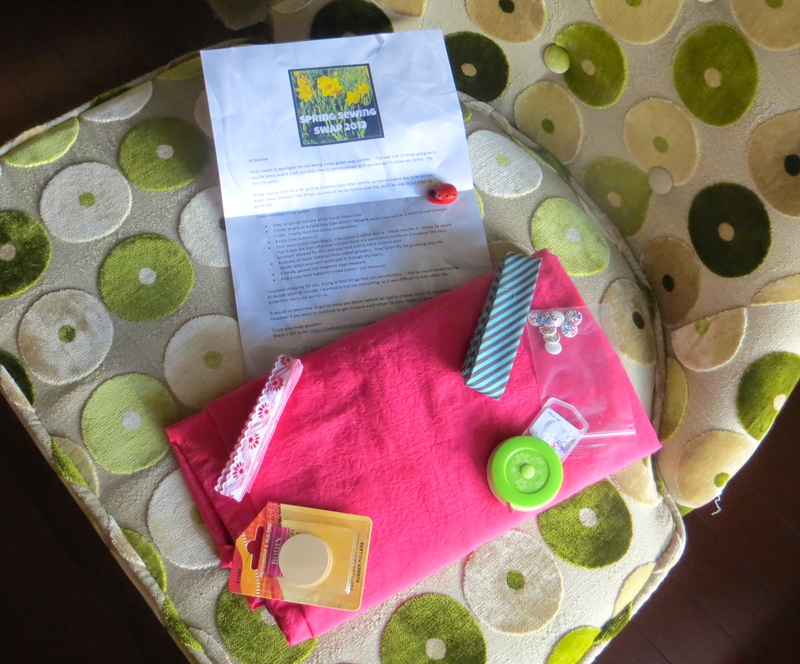 May 22 (Wednesday) — My day off and my first repeated item. I spent the morning dropping my car off to get serviced then met a new sewing buddy for some fitting help with a jacket project (Thanks, Nancy! You are incredible!!!) 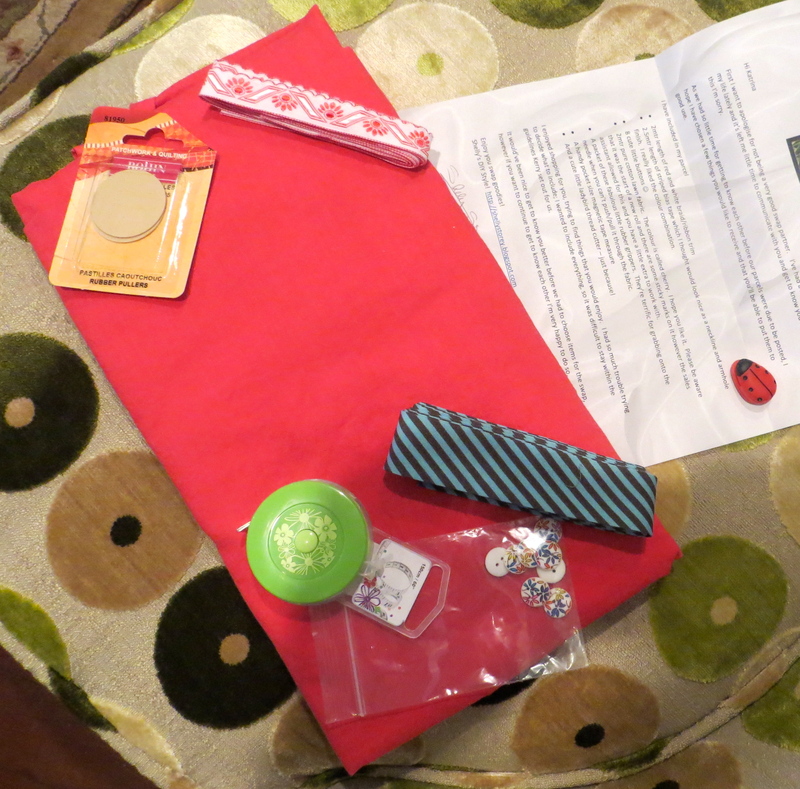 Nancy was so sweet and sent me away with an armload of awesome sewing goodies — patterns, fabric, notions — I feel so spoiled! 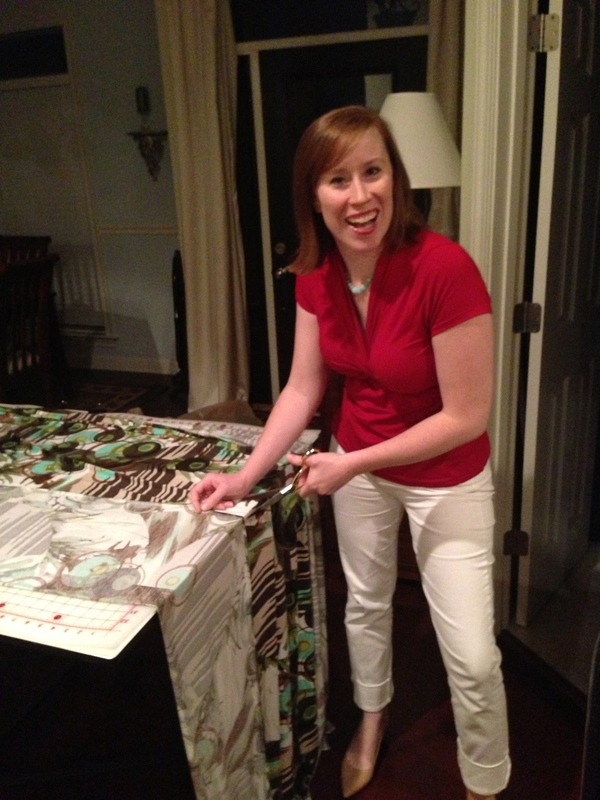 This was also the night of the CAbi party that I hosted for my friend Catherine. For the party I made peach margaritas, fresh guacamole, and strawberry cupcakes with strawberry swiss buttercream; I picked up a party platter of fajita fixings from a local Mexican restaurant to round out the menu. Yum! We had a great time having a girls’ night in. Photographed here with Jennifer, one of my best friends since first grade. May 23 (Thursday) — A full day at the office at usual but in the evening my 5-year-old niece graduated from her pre-K school. I cannot believe she will be a kindergartener next year! The black skirt you see me wearing here is at least 12 years old. I bought it when I was in college and have hung on to it since, knowing that it would come back in style again. Unfortunately the elastic in the waistband has dried out so I will have to replace it before I can wear it again or I will risk wardrobe malfunction. 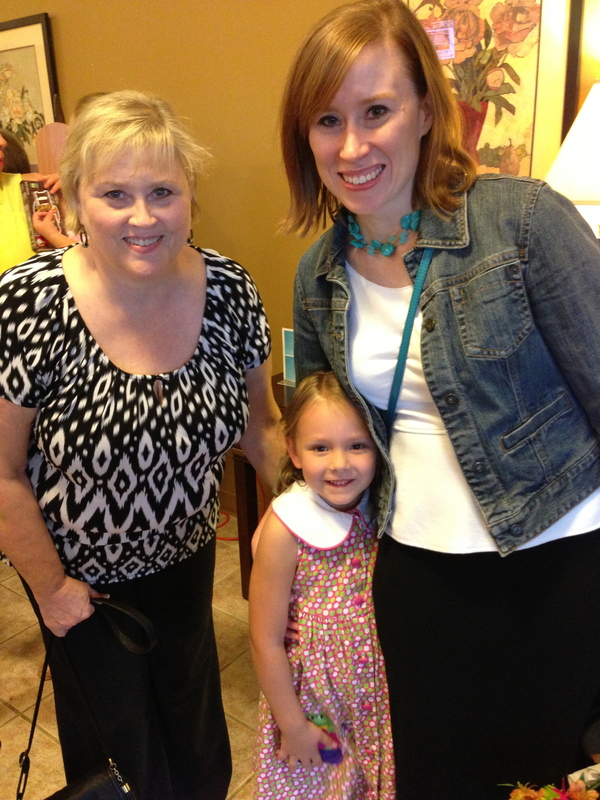 I am posing here with the niece of honor and my mom. May 24 (Friday) — TGIF and I’m not on call! 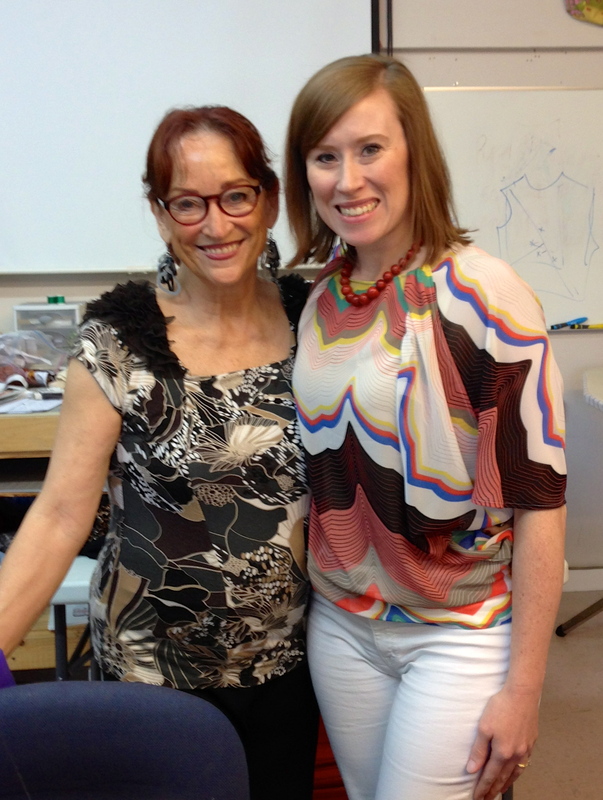 Plus this is the weekend I get to spend sewing nonstop at the Sandra Betzina workshop at All About Sewing. In this photo I am working on McCall’s 6559 which you will see more of later in the week. May 25 (Saturday) — The Sandra Betzina trunk show took place this day. She went through the samples of all her patterns and discussed different techniques for altering and modifying each pattern. Although most of Sandra’s patterns don’t appeal to me right off the cover (I don’t think I am in her age demographic), changing fabric and/or features can definitely make them more attractive (see my project from last year’s workshop here). After the trunk show, we each sat down with Sandra and our chosen pattern (Vogue 1291 for me) to select our size and make any fitting adjustments to our flat pattern. We then all went home to cut out our fabric. 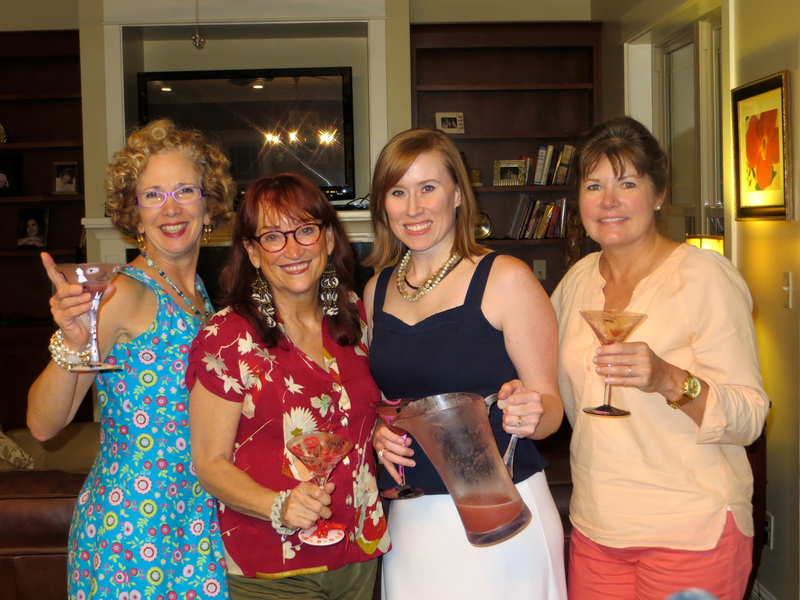 Except a few of us didn’t go straight home — my sewing bestie, Dianne (far left), invited Sandra, me and Joni (far right) over for dinner at her beautiful new home, spouses included. 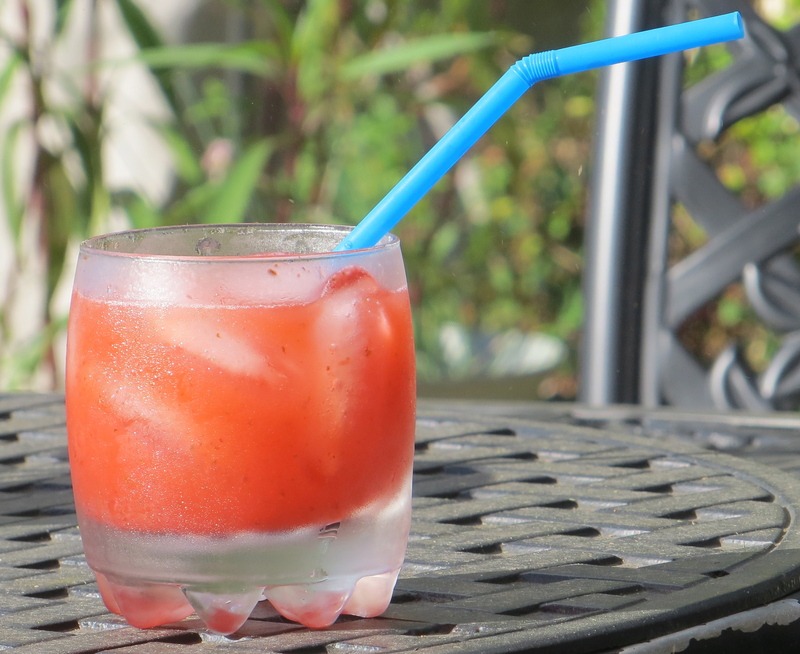 I was asked to bring a cocktail, so I made a double batch of the Strawberry Riesling Slushies that Annie recently featured on her blog (if you couldn’t tell from the empty glasses and pitcher, the drink was a hit — not too sweet but very refreshing!). Mr. Homemaker and I had a wonderful time — our dinner companions were lively and entertaining and our hostess prepared an excellent meal for us to feast on. Thanks again, Dianne! May 27 (Monday/Memorial Day) — This was our second full day of sewing. I finished almost all of the construction of my shirt on Sunday so I just had to hem it and stitch down the neck band when I got to the store on Monday morning. 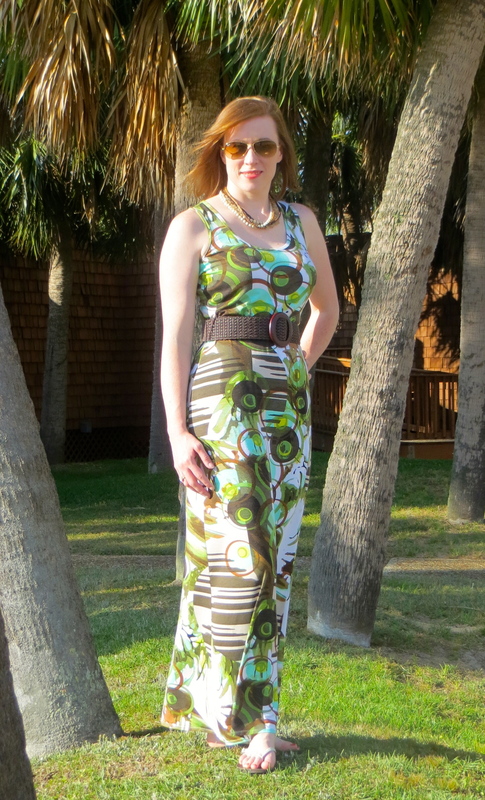 After that I made a few more flat pattern alterations to my knit maxi dress (McCall’s 6559) based on a knee-length muslin and cut out my fashion fabric. Before we finished up for the day I had my shoulder seams sewn, the neckline finished with my new favorite method, and my side seams sewn. All I had left was to bind the arm holes and hem it. 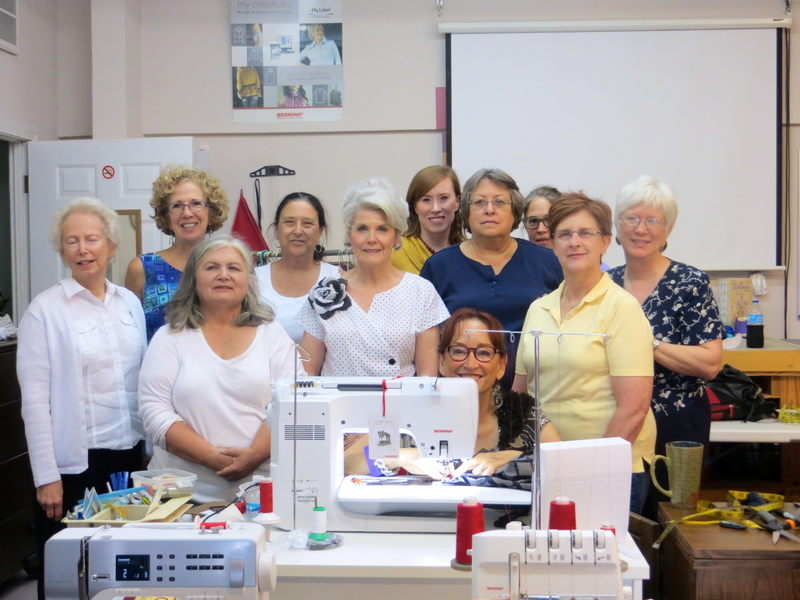 This photograph is a group shot of some of the ladies at the workshop. We all had a great time and got tons of sewing accomplished! Sandra is a great teacher and I always learn lots from her and the other students who all have more experience than me. I am already looking forward to when she returns to our area next year. May 29 (Wednesday) — My day off but this was a pretty busy one with running errands. I started out with stopping by the hospital to check on my grandfather after he had surgery (he did great), then I had a dentist appointment, dermatologist appointment, grabbed a quick lunch, packed up some of my sewing stuff, headed to a friend’s house for a sewing playdate for a few hours working on tracing off and making flat pattern adjustments to the Colette Chantilly pattern, ran to the grocery store, then came home and cooked dinner for my husband. I actually scored a “This is one of the best things you’ve ever cooked” from Mr. Homemaker so the recipe will be making an appearance here in the future. Be on the lookout. May 30 (Thursday) — Back to the office. Two me-made pieces this day. I added a belt over the Hollyburn skirt and I really like the look. May 31 (Friday) — Yay! I made it!! This is my most recently finished project — I started it during the Sandra Betzina workshop and finished it up the Thursday evening after so I could wear it before the month ran out. I will dedicate an entire post to this pattern, but can I just tell you that I LOVE it! 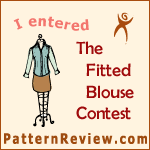 It is so easy and once you figure out your fitting tweaks and the sizing, it is such a flattering and comfy dress. I am going to make up more versions in both the long and short varieties. And can I just apologize for the awful photo? After 30 days of remembering to take daily outfit photos, I hopped into bed last night and remembered I hadn’t taken my photo for the day. Well, I wasn’t going to mess up on the last day of the challenge so I jumped out of bed, threw my dress and belt back on and tossed my iPhone to my husband and made him snap some photos of me in my bare face and bare feet. While I was at work, I paired the dress with my denim jacket and some white leather d’Orsay pumps. After work, I nixed the jacket and changed into some white flip-flops for a casual business dinner. I also paired the dress with a multistranded Silpada necklace (seen on May 25). Reflecting on the month, I feel like I have grown in my sewing skills, especially in fitting. I finished several new items during the month — 7 total — and overall they each fit really well and I don’t have any major construction complaints. I do need to bite the bullet and start working on fitting myself for pants and shorts. All in good time, I guess. Well, guys, thanks for following along. 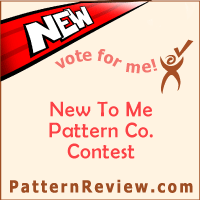 I have several pattern reviews to bring you as well as some recipes for desserts, drinks, and main dishes. Stay tuned!